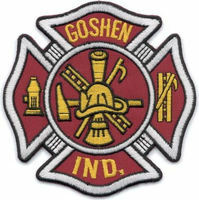 The Goshen Fire Department offers hands on fire extinguisher training for all businesses located within Goshen City Limits. We use the BullEx Live-Fire Extinguisher Training System. This system uses propane gas, producing intense flames, making this a realistic workplace training session. Class A, B or C fires can be selected at four different difficulty levels; challenging the trainees. Because this system is propane-fed and uses only compressed-air/water training extinguishers, there is no added cost or clean-up associated with using a typical ABC fire extinguisher; the type typically installed in every business. The BullEx Live-Fire Extinguisher Training system allows for quick set up and no clean-up! This training system meets OSHA and Indiana Fire Code requirements which mandate that all employees are trained to know the location and proper use of portable fire extinguishers in your business. The Goshen Fire Department offers this training to your employees for a small donation. We ask for a $250 donation per 10 trainees; additional trainees in groups of 10 would cost an additional $75.00. We do ask that each class have up to 30 people maximum. To meet the needs for your company; we can set up and conduct the training at different times of the day as well as location. This allows all employees the opportunity to attend a training session. We will show a 15 minute DVD, discuss your extinguishers and then go outside to do the hands-on portion. A normal class is up to 30 people and will take 45-60 minutes. We can supply the DVDs for your employees to watch on their own time; then set up the fire extinguisher trainer outside. 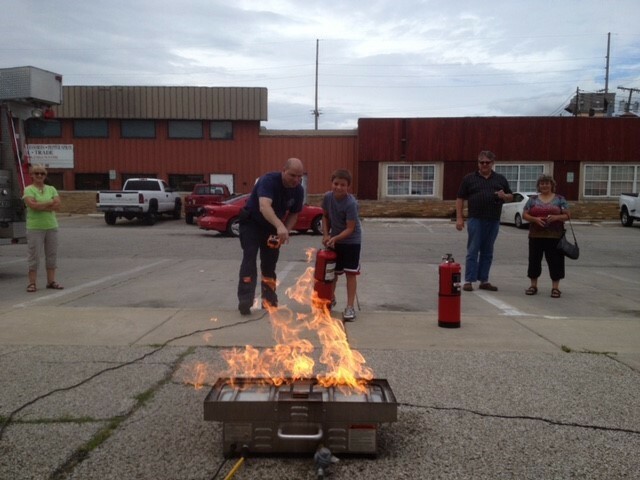 When small groups arrive, we instruct them about your extinguisher and run them through the hand-on portion. Typically groups of up to ten employees will not be longer than 15 minutes. As soon as each employee completes the hands-on they can immediately return to work. Note: You must supply a means of showing a DVD to your employees. There must be an electrical outlet nearby for the fire extinguisher trainer that will be set up outside. On days that are raining, we can set up the trainer just outside of an overhead door so employees will not get wet. If needed, we can do classes in the winter, but spring and fall are ideal times. We can provide a certificate of completion for each employee if needed; we just ask that you supply us with a clearly written attendance sheet.